Mon., April 4, 2016, 1:07 p.m.
BOSTON – The calendar may say spring, but winter struck the Northeast hard Monday, delivering a storm that could end up dropping as much as 10 inches of snow in some places. Winter weather advisories were issued from the Buffalo area to Albany in New York, where forecasters are calling for up to 10 inches of snow at higher elevations. Southern New England was also getting hit by the slow-moving storm, with up to 6 inches of snow forecast for most of Massachusetts, including the Boston area. Southern New Hampshire, as well as northern Rhode Island and Connecticut, could also get up to 6 inches, with less in coastal areas. 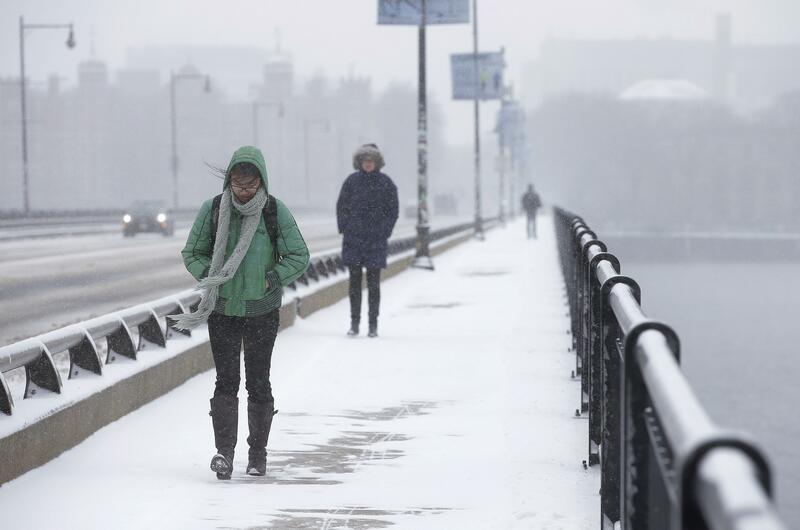 Dozens of school districts, mostly in western Massachusetts, canceled classes for the day. Dennis F. Conte, of Johnston, Rhode Island, decided not to venture out early Monday because he worried about getting into an accident. By late morning, Conte decided it was safe enough to do a few errands. Outside Dave’s Marketplace in East Greenwich, Rhode Island, Conte said that while snow this time of year is unexpected and makes things difficult, it’s simply nature. The maximum speed along the entire length of the Massachusetts Turnpike was reduced to 40 mph, and state and local police responded to dozens of fender benders. In West Hartford, Connecticut, a woman was cited for an accident with a school bus during the storm that sent the driver to the hospital. Police say one student also received a minor injury but wasn’t hospitalized. The snow was expected to come down in bands and last into the evening, when temperatures will plummet, and some streets could freeze over. Low-temperature records that have stood for more than a century could fall in some spots, according to the National Weather Service. Monday’s storm came a day after several inches of snow fell in some areas and high winds toppled hundreds of trees across New York City. High winds brought down a rotted tree in Abington, about 20 miles south of Boston, on Sunday, killing a married couple in their car. Although northern New England was not expected to see much snow Monday, the cleanup continued a day after winds that gusted up to 50 mph knocked out power to tens of thousands in Maine. And although Maine wasn’t getting much snow, it did get cold enough for the Sugarloaf ski resort to make snow, the first time in the resort’s 65-year history that it’s fired up its snow guns in April. Sunday’s high winds also knocked out power to tens of thousands of customers in New Jersey and Pennsylvania. Updates snow forecast totals, and information about Connecticut accident. Inserts comments from Rhode Island man. Deletes dated material. With AP Photos. Published: April 4, 2016, 1:07 p.m.